Tonight on ABC ROOKIE BLUE continues with another new episode called “Exit Strategy.” On tonight’s show a suspicious home invasion is investigated by Dov and Chris. On the last episode despite a generous offer from Inspector John Jarvis, Oliver wasn’t interested in extending his contract as Acting Staff Sergeant. He was thrilled to be going back to the street. But Oliver’s day took a serious turn for the worse when his daughter Izzy showed up unannounced at the station, and when he learned Professional Standards is arriving early for Duncan’s dismissal hearing. Oliver and Andy do some crash-course prep, but both were rendered speechless when Duncan presented incriminating new evidence against Andy. Cornered, Oliver found himself making the exact kind of professional deal he never thought he would be capable of making. Did you watch the last episode? If you missed it we have a full and detailed recap, right here for you. On tonight’s show following Dov’s discovery of Chris’s cocaine problem, Chris seems to have gotten back on the right track. But while working a residential home invasion case, Dov realizes that Chris might not be ready to change after all. Meanwhile, back at the station, Steve informs Traci that he’s about to raid an illegal gambling den where her ex-husband is a regular. Both Traci and Dov must make decisions that will greatly affect the people closest to them. Tonight’s episode is going to be an exciting one that you won’t want to miss, so be sure to tune in for our live coverage of ABC’s Rookie Blue tonight at 10 PM EST! While you wait for our recap hit the comments and let us know how excited you are about the new season of Rookie Blue! In the meantime, check out a sneak peek video of tonight’s episode below. 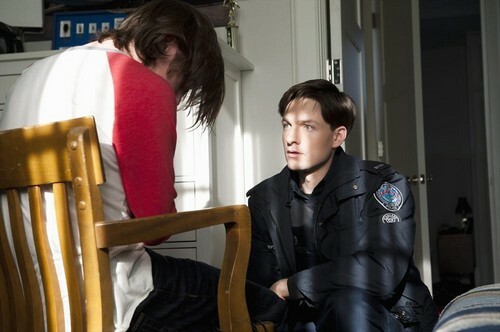 Tonight’s episode of Rookie Blue kicks off with Andy out for coffee with Sam, venting about Oliver. She thinks that Oliver backstabbed her, but Sam argues that “backstabbing isn’t really Oliver’s thing.” He comforts her and leans over the table and kisses her. At the station Traci receives an email from her lawyer and freaks out, her husband Dex is taking her to court and is going for soul custody of their son. Peck comforts her and says that he is just trying to scare her. Inspector pays Oliver a visit and tells him to double up uniforms in Swansea. Oliver argues that he can’t pull the plug on the raid, to put men in an upper middle class area. The Inspector doesn’t want to hear it though. Peck gets news that Oliver is pulling the plug on the raid on the illegal gambling ring. He confides in Traci, and tells her that her ex husband Dex is participating at the illegal gambling house, and when they do finally raid it, he could go to jail for two years. Dov and Diaz head out on patrol, and receive a phone call about a car idling for a long period of time. They arrive at a house, and someone left their car in the driveway running, with the door wide open. They turn the car off, and head to the house and find the front door wide open. They walk through the house and it appears to be ransacked. Someone starts yelling for help, he’s locked in a room. He says that he was leaving town and forgot his passport so he came home and someone was robbing his house and locked him in his studio. Dov heads upstairs and finds a ten boy tied to a chair with his face wrapped in a sheet. Dov questions Seth, the teen boy tied upstairs, he says that his parents were leaving town and he ditched school. He says he walked in the house and someone jumped him from behind and tied him up and he never seen their face. Meanwhile downstairs Andy is questioning Seth’s step-father Ewing, the guy who was locked in the studio. He makes a list of all the items that were stolen, and adds that the thief even took some of their silverware. Oliver heads back in to the station and tells Peck that he is giving him the men for his raid. Traci tells him “good luck” and he rushes off. Seth’s Mom Jackie shows up at the house in a panic, and Andy reassures her that everything is fine. Andy and Dov head in to the other room where a window was broken, and realize that it was broken form the inside of the house. They think it was an inside job. Back at the station Gail and Andy do some digging and realize that Jackie’s company is going under, and the family is broke. Sam brings Ewing in for questioning, and he has no idea that his wife is on the verge of losing her company. Ewing says he needs to talk to Jackie because she handles all of their “money stuff.” Sam hints that it might be insurance fraud. Ewing says that wasn’t the case because he had weed in the studio and someone stole it. Traci meets up with Dex and warns him that the underground casino is going to be raided and if he is there he will go to prison. He says that he was just trying to cover some of his legal fees. Traci tells him that he can’t tell anyone she tipped him off. Jackie comes in for questioning, and Andy and Gail question her about her bankruptcy. She says there was no way she would have staged the burglary, because her son Seth was attacked. She reveals that she put a nanny camera in Ewing’s studio because she thought he was cheating on her. Peck takes his team to the underground casino with their warrant, and when they arrive the site has been completely abandoned. There is nobody there to arrest. Back at the station Traci confesses to Peck that she warned Dex, and he must have tipped off everyone at the operation. Dov and Diaz find the nanny camera at the house, and get a perfectly clear shot of the intruder on the camera. They ask Seth if he recognizes the thief and he insists he doesn’t, and goes back to his bedroom. Dov reveals that he read Diaz’s text messages earlier, and he seen a message from his drug dealer. He accuses Diaz of lying about coming clean and going to the AA meeting, while they are arguing they hear a gun shot. They rush to Seth’s bedroom and see that he has shot himself in the head. He’s barely breathing, they call for an ambulance. While he is lying there bleeding, Seth confesses to Dov that Tim Rockett is the guy in the video and he helped him rob his own house. While Dov and Diaz are waiting for the ambulance, they smell gas, and realize that the bullet hit a gas pipe and it is hissing out of the wall. They decide to move Seth before the ambulance get there, but realize that they are locked in the room. They radio for help, but none of the officers or EMT’s can go in the house until the power and gas are turned off. Dov manages to break through the wall, and they drag Seth out of the house and he is loaded in to an ambulance. At the station Traci is putting away evidence from Peck’s gambling case and realizes that the date on some of his pictures was wrong. She realizes that Peck set up the whole thing to take down Dex, and manipulated the evidence. She calls him out on it, and he reminds her that she didn’t exactly follow protocol when she tipped Dex off. Diaz asks Dov if “they are cool” once they get back to the station. Dov says he is done keeping Diaz’s secret, and says he is going to tell Oliver about his drug problem. Diaz stops him and says that he will tell Oliver himself. Andy stops by Oliver’s office to talk about the hearing. Oliver reassures her that he is on her side, he always has been, and he always will be. He thanks her for stopping in and making amends.